As every year in November, to celebrate the submission of NSF proposals, there are daily posts here on Xykademiqz. 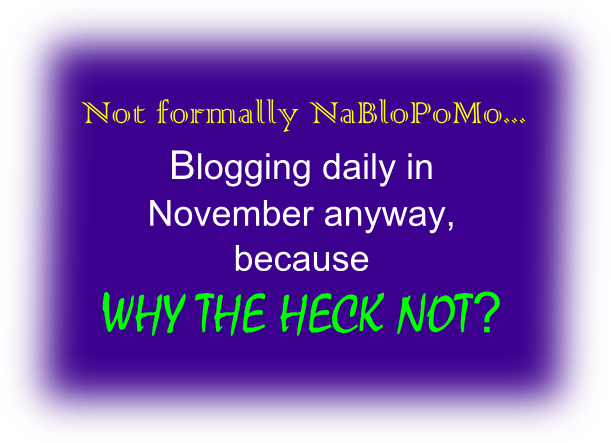 You can think of November daily blogging as my unofficial contribution to NaBloPoMo, a companion to NaNoWriMo. Invite you to suggest topics for me to write about. I know the last few times I did not get to all the topics that were requested. If I never got to yours, I’m sorry! Please request it again, and I pinkie-swear I will get to it this time. I’d love for you to write about the relationship between faculty mentors and grad students. This could potentially include topics like: Things faculty mentors are thinking that would never occur to grad students, but that it would be useful for students to know; Things grad students can do to cultivate a good relationship with their faculty mentor; Things grad students should avoid doing because they irritate faculty (which I know you’ve written a bit about before)…or whatever else you think might be useful. As a current grad student, this topic is of particular interest to me! If this is the official “request thread” I’d like to echo anonPs question from the comment section of “Working with grad students .. pt1”: How can you tell if someone will be a motivated and productive student when you interview/select applicants? It may be too much for one person to request two topics, but I’m going to go for it anyway. 😉 As a woman in academia, I really enjoy reading stories about your kids and family, and how you manage to balance family life with being an academic. Would love to see some more of that! Related: I’ve also seen people switch departments at various places I’ve been, usually from a dysfunctional one to a better one in an overlapping field. How does that happen? Dry appointment first? Are these things different pre- and post-tenure? A problem I’ve been having recently. I’m newish faculty (in my second year!) at an R1, and one of very few women in my department, which makes it hard to go to other people for advice on this. I have a new student this year, and she’s, well, brilliant. I think of theory as really having two major components – there’s the technical stuff, which you can learn in classes, and there’s the more intuitive part, which is how people learn how to ask good questions, and is how you get a ‘feel’ for data. I’m good enough technically, but I have a career because I’m very good at the second part. It’s also worth noting that I’m in a subfield where good theory is usually close to experiment, and where mathematical frameworks don’t really exist yet. Anyway – my new student. She worked in the field as an undergrad, and it turns out that she has a better understanding of the literature than most postdocs in our department. She’s technically not great, but she’s solidly at the top of her classes, so I expect that she’ll be at a point where there’s not much I can teach her in that respect in a year or two. And most importantly – she asks REALLY good questions. She’s been here for two months and I’m already planning on writing a grant based on something she brought up! And no, I spoke with her old undergrad advisor, these aren’t things that she lifted from his group and is pretending to have thought of, even accidentally. I don’t know what to do with her. I’m encouraging her to spend a lot of time on classes and get her technical skills up to par, but beyond that – I don’t know how to help her. If I were to honestly advise her I would tell her to find someone else to work with – she’s going to be a better scientist than me very quickly. Or I can graduate her very quickly. Or I can just give her a lot of independence while keeping tabs on her, and treat her like some combination of a 20 year old and a senior postdoc? I wondered if you could help me with a dilemma. I’m currently a postdoc and at the outset of my postdoc started working in an area that is woefully underresearched in a specific population of people – like literally only two people are doing this kind of research, but they don’t have the sample I have to really do it justice. 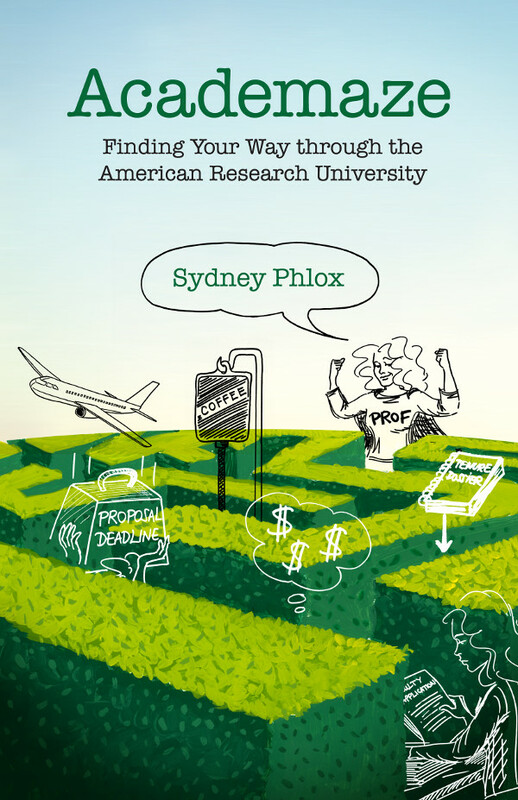 I was super excited when I found this area because it seemed like it could really help me establish a strong program of research in a space where few people were working (but that is critically important), and I got an F32 to support my work. My mentor has been increasingly becoming interested in this area and is now writing an R01 to fund a study basically overlapping my work and using novel methods I had planned to do in my NIH K (which my mentor knows bc my K is drafted already). I have expressed concerns about this on multiple occasions, but they don’t see the issue. I’m worried because if that grant is funded, I will no longer have a clear independent area of research. I’m worried because any postdocs or students they take on will be then working in my area. I’m worried because my mentor is asking other people to work on projects in this area with them – whereas I had previously been taking the lead on all projects in this area of research. Finally, my mentor is communicating with experts who focus on this area of research in other populations. I had connected with these people with the idea that they could be collaborators for me – but instead my mentor is having them be consultants on their grant, and having phone calls with them to learn more about this area, but not even including me (and it could have been a really good training opportunity for me). Also (sorry, this is long!) – I am writing a foundation grant extending my research. My mentor said last night they wanted to do a presentation this summer that is exactly what I am proposing in Aim 2 of this grant. My mentor knows this bc they have read drafts of the application. They just don’t see this as an issue. I feel like I need to change my area of research because I just won’t be able to argue that I am an independent researcher when I apply for a K – and I am frankly so upset by this it is affecting our relationship. But part of the issue is that I am right at the beginning of a 3-year F32 focusing on this area of research – and just starting to establish myself in this area of research (one pub and a few presentations). I’ve been assured I’m not overreacting to this (although my emotional reactions aren’t helpful) by another mentor – but talking to my current mentor just is doing nothing. And they are so immersed in this literature now that there is no way they won’t apply for the R01 (and I am pretty sure it will be funded). Any help would be more than welcome. Do you have a suggestion for how junior faculty should navigate the reference letter requests in these situations? And general comments on maintaining confidentiality if you don’t want word to get out that you are considering moving? I’m pretty far into my position but still trying to figure out what kind of productivity to expect from postdocs and grad students. Part of the problem is that I have a hard time gauging how productive they really are, e.g., when it seems to take several weeks to develop a mathematical model, and there are changes but no obvious improvements from one week to the next (we meet weekly). Sometimes I ask how they’re feeling about their progress, and they’re usually feeling okay, but I occasionally… perhaps often is more accurate… get frustrated because I can’t see where the time is going. I try to have faith in them but am afraid I am letting some off too easily or allowing problems to fester. I’ve drawn hard lines with a few (and let two go, after it was REALLY clear nothing was getting done). I also have this uncertainty about the type of help I give them. Sometimes I feel like I have to do more of their thinking for them than I should and want to, and I wonder if I’m just getting lazy or too entitled or (occasionally) don’t want to undertake the hard work of figuring all their problems out. My own advisers were extremely hands-off. I’ve seen some who are far more involved. I’m not sure what’s right. How about a post about the merits of travel – we scientists fly endlessly around the world, at great cost to the environment and our families. Personally, I would like to just stop travelling for work. It’s hard on my kids and on my time and well-being. But the invitations are insistent and never-ending. It’s embedded into our culture. 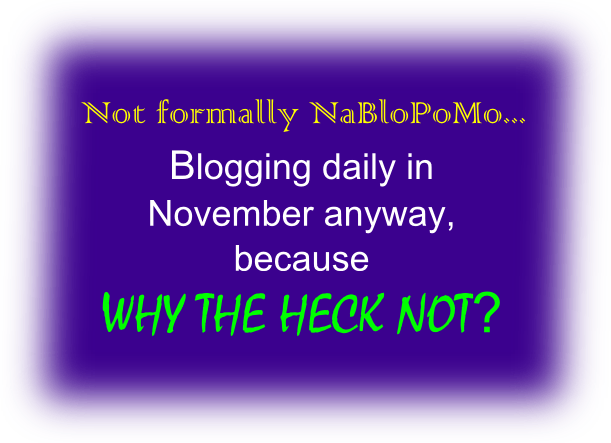 How do you (kindly, but firmly) decline someone? How do you manage travel expectations as you climb up the ladder? If a nonessential part actually prevents you from doing a job on the essential part or kills your will to live, maybe it’s time to rethink how you spend your energy. This kind of hit me, but in the opposite way that you meant. What if it’s a part of the essential part that is starting to kill your will to live? In my case, it’s the year 1 and 2 courses of a techcnial specialty taught to a very diverse group of students, some 20-30% of whom are almost computer illiterate, hate maths or can actually do maths, but have zero confidence in themselves. I have dealt with it sufficiently well until this year, when all the student computer rooms where we have labs have been converted to Win 10, with which the specialty software (which is the industry standard, so we can’t switch to something else) does not play well. 90% of class time this year was spent troubleshooting software or dealing with computer illiteracy (which I’m also noticing seems to be on increase, as students keep using phones/tablets and are helpless when they are asked to open a zip file, which they have never encountered before or when they can’t understand why specialty software doesn’t work on their Mac laptop – because it’s a windows only software, nothing we can do about it). I managed to get through the semester, but I can’t deal with this again, I am not teaching the technical specialty, I am standing next to each student telling them where to click instead. And if you ask if I have TAs, yes, I do, but our classes are large (200 students) and I can only get one TA, so we both have to be present in labs (40 students per session). I have also noticed a very passive attitude of the students towards software (or even fear? ): when something crashes/goes wrong, their reaction is not what it was previously (re-start the software, try again, then if the problem persists, ask teacher for help). Instead they just sit and look at the screen and wait until I get to them to fix it for them – it’s like they are afraid of doing something that might break the computer? Very weird. So perhaps another topic for you to write about? How to deal with the increasingly lower computer literacy of students? I dislike traveling but am putting up with it for only another year. (Soon getting a Southwest Companion Pass so my husband can tag along occasionally!) It constantly amazes me what valuable connections I make while traveling. Many of the trips involve potential funders, and I feel a need to see what other bigger, faster labs are up to so that I do not accidentally compete with them. What if it’s an arguably essential part that is killing my will to live? I spend more time mentoring than doing science, by which I mean that most mentoring is just getting people to think about what they are actually doing or trying to say. I know I’m teaching valuable skills, but it makes me so sad to spend more time teaching basic writing, talk organization, exploratory analysis, and literature search techniques (as if there’s much to teach!) instead of digging into the problems themselves. It’s draining, it stresses me, and I occasionally resent my trainees (a symptom of burnout, and one I aggressively manage). I am realizing I would rather have a much smaller lab and do only a few hours of such mentoring per week than the few hours per student/postdoc per week that I am averaging now. I am ambivalent about getting tenure at this rate. Not November anymore, but I hope you are still watching this space. I will start my own group end of next year and of course I am already obsessing about the best way to run it. So, what do you do in your group seminar/regular meeting? I have seen a variety of things in the groups I worked in: people presenting their own work, people presenting interesting outside papers, a round where everyone is telling what they are doing right now, etc. All seem to have pros and cons and all seem to be disliked by the people who are forced to come. What has been your experience? Anything you would recommend to try or not to try? I am in STEM if that matters.